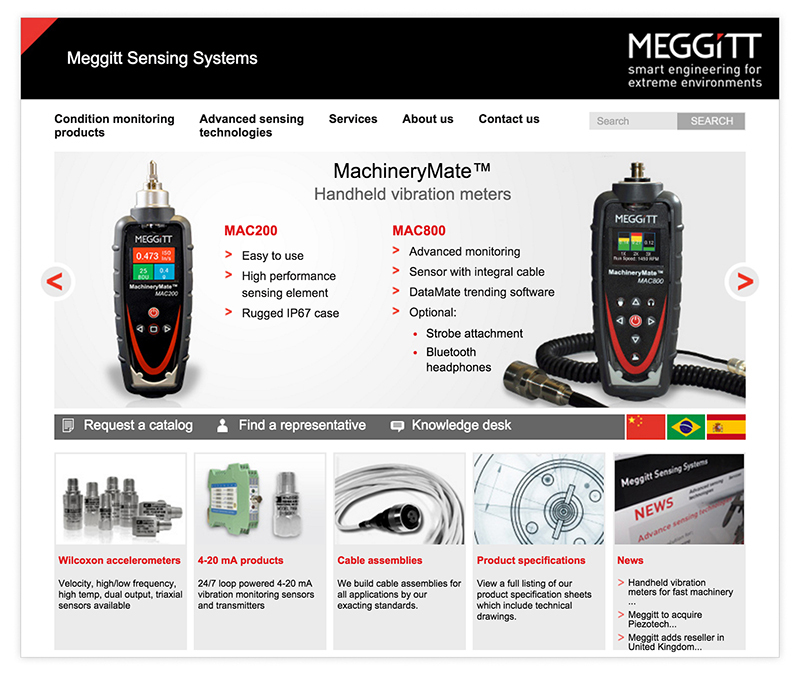 For over 50 years Meggitt Sensing Systems has been recognized as the leading supplier of high quality, cost effective predictive maintenance equipment including vibration monitoring sensors and transmitters, accelerometers, signal conditioners, hazardous area sensors and related equipment. 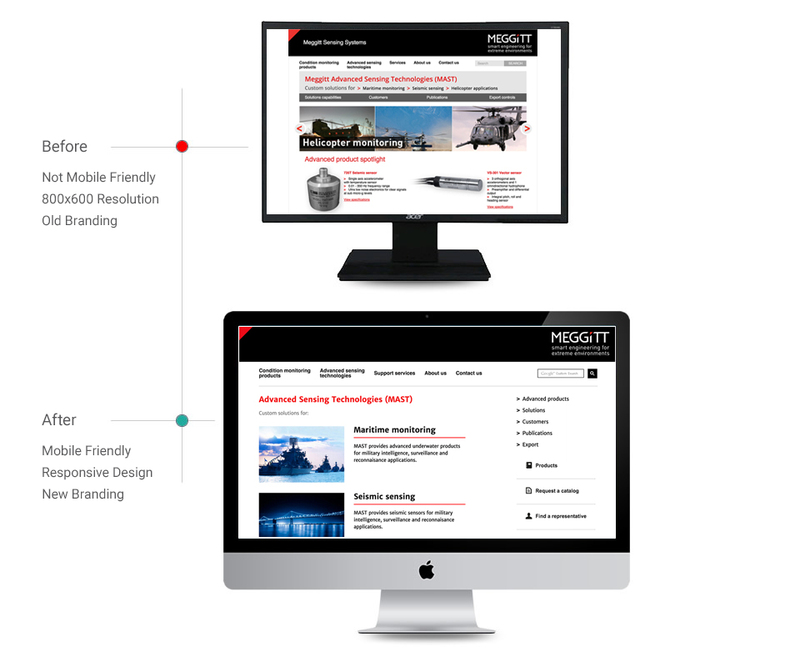 Meggitt needed a digital agency partner for the Wilcoxon division website and since coming on board in 2010, HindSite Interactive has served as the dedicated digital partner for Meggitt and its web presence and digital and data visualization needs. When HindSite partnered with Wilcoxon, the site’s existing platform had numerous back-end errors and issues with content management, Search Engine Optimization and lack of website support to help the organization support it’s online presence. HindSite has worked with the client to help improve the website from both design and development and user experience. Meggitt began to realize their web presence was out-of-date and needed to move into the future. The current website was not mobile-friendly, so it could not be viewed properly on any mobile devices. This coupled with new marketing initiatives caused Meggitt to call upon HindSite’s assistance, as they have done many times over our 6+ year partnership. 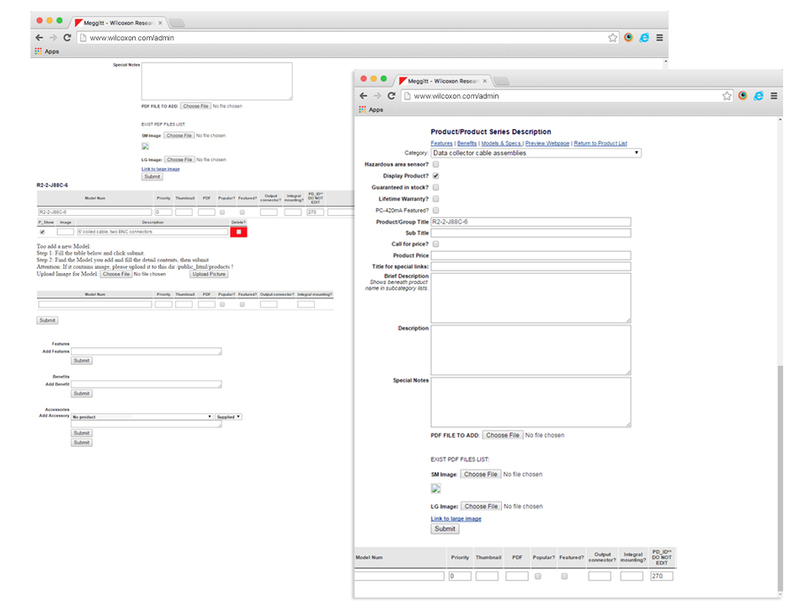 Meggitt worked closely with HindSite to finalize a user interface that would improve the end user experience. The new site is based on the 960 grid vs. the former 800 pixel width, which has become obsolete. The new site needed to be responsive so users on various devices could search for products, get quotes, or research the products being offered. We did not want to suspend accessibility to the current website, so the development team took a systematic approach when transitioning to the responsive format. Instead of a complete overhaul, the team updated specific pages that used the same layout/template. 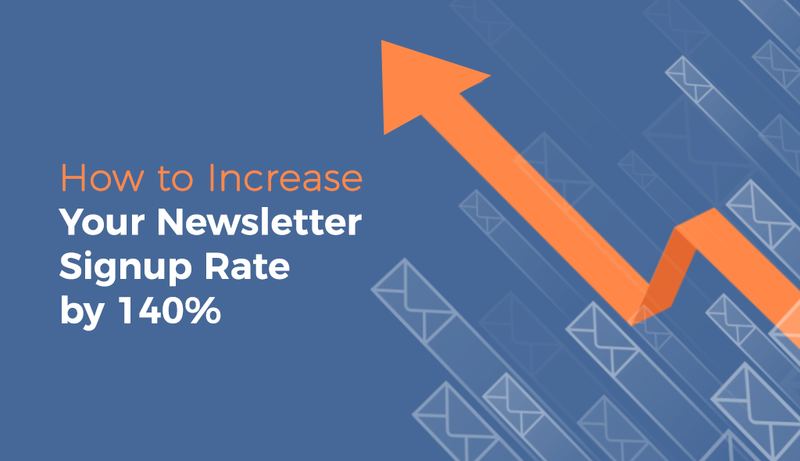 Using this method the transition took place gradually over the course of a month, without interrupting normal web traffic. As shown in the examples below, the layout of these and other pages have been given a facelift. The layout is now wider, expanding to the full 960 grid, menu text larger and easier to read, sidebar menu for internal pages condensed into specific categories and accompanied with icons, visual elements arranged to create more negative space, increased usability and simplify the process users take to interact with features and actions. It was important that internal Meggitt content editors could make updates and maintain the site on their own schedules without requesting edits through HindSite. With that in mind the development team updated each template with the revised custom fields and input areas, during the transition to the new site layout. The back-end was built using Adobe ColdFusion. However, the site had been running an out-of-date version of ColdFusion for the past few years. Once the development team had completed migrating all webpages to the new layout, we updated the entire site to the newest version, ColdFusion 11. We have also worked with Meggitt to improve their search rankings on target keywords and achieve page 1 rankings on numerous target keywords and continue to help the firm improve upon them. With over 50 years of high reliability and performance, Meggitt has a diverse range of specialized products, including predictive maintenance equipment and world-class sensing systems. 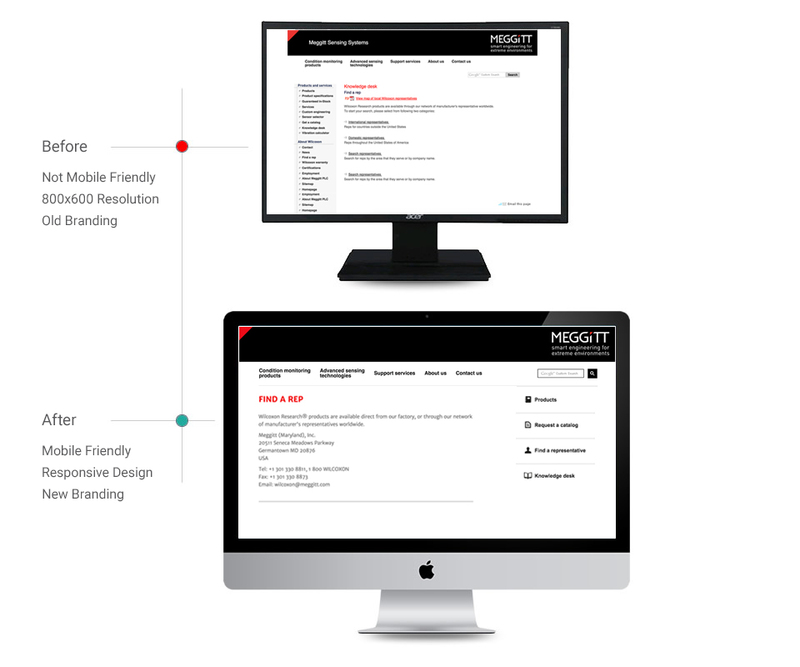 To maintain a visible presence in these industries Meggitt approaches marketing by using traditional and web advertising techniques and data visualization. The homepage of the website displays key products using a slider carousel. HindSite has been developing custom graphics for this area, as it drives traffic to targeted products across the site. 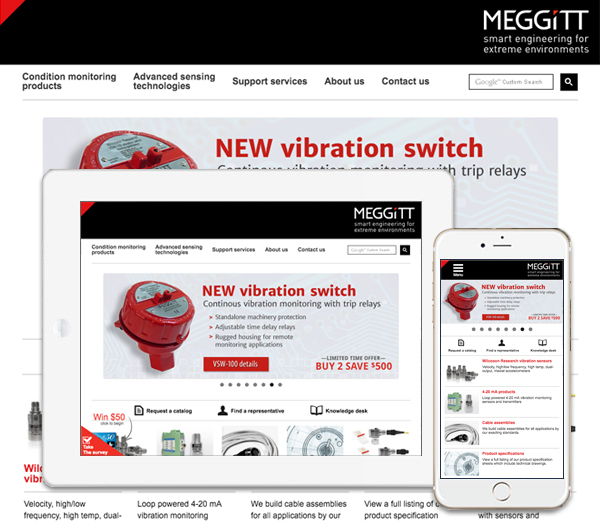 Meggitt targets high-traffic industry websites to advertises with. We have created various animated web ads in an effort to create interest and convert users into qualified leads for product purchasing. The ads developed are created outside the animated AdobeFlash environment, to increase prospective customer visibility by reducing the chance that the ad is blocked due to web browsers that no longer support Flash. 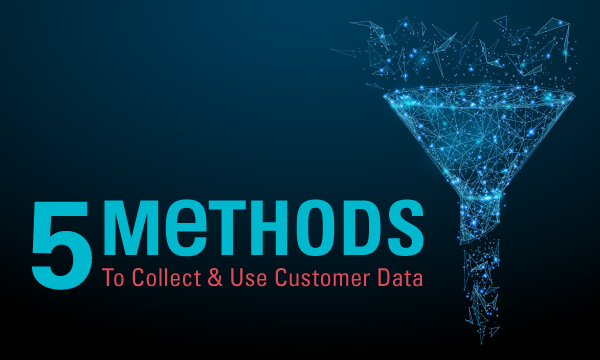 Data Visualization is the structuring of information for a specific topic or theme, using visual and/or graphic elements to convey an idea or message. 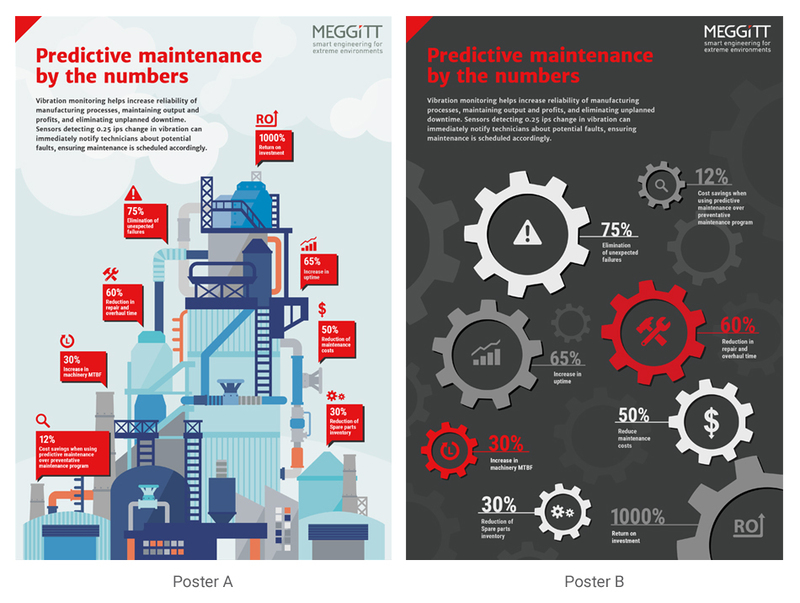 Meggitt has chosen to use data visualization to describe, by the numbers, the benefits of using their Vibration Monitoring products. 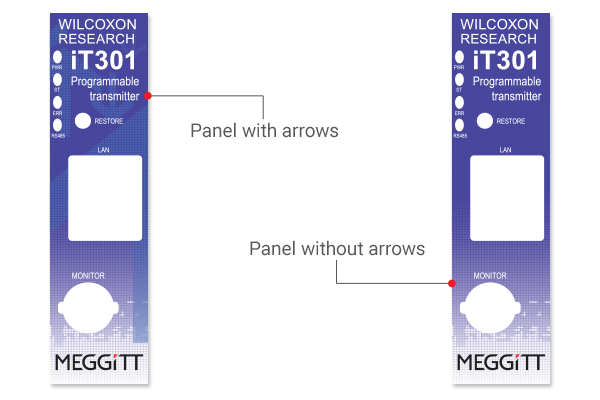 Incorporating Meggitt’s own research, the data was organized into easily readable format using graphics to illustrate the product benefits. Several Meggitt products contain a set of controls that help technicians read and adjust internal settings. We have assisted them in creating graphics for these control panels. Each panel has to be precisely sized to a specific dimension to ensure a successful application onto the product or instrument. Both examples below show similar panel graphics that were applied to different products. 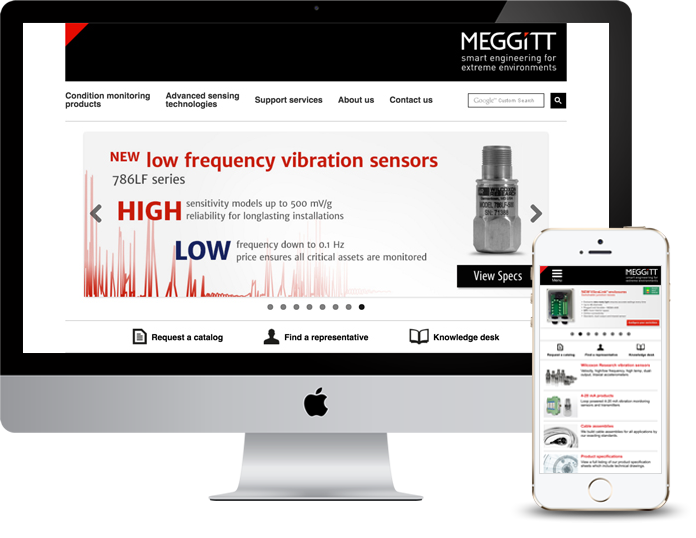 The new Meggitt Sensing Systems website has allowed the site to be edited and maintained more easily by internal content editors and increased efficiency and security by running the current CMS version. For the end users, the new interface is easier to navigate, search and complete tasks as well as allow mobile users to enjoy a fast responsive experience to locate products, get quotes, and research the offered products. Adjustments to the site and graphic services continue as they are needed to meet Meggitts’s business and marketing goals and now working with the client to create web based calculators, and industry specific landing pages. "The team at Hindsite is very responsive and offers great website expertise. Our site is very outdated and hard to navigate, over time Hindsite has helped suggest ways to improve our design and usability. When we send a project to Hindsite the final product is always an enhancement of what we had in mind. They have helped with every aspect of our site, including design and layout, graphic design, usability, SEO, and application work and design. Everytime we submit a project to Hindsite I look forward to our site being more user friendly, and seeing the great work they’ve done." "In my experience working with Hindsite Interactive on the development of our new website has been exceptional. Payman Taei, and the rest of the HindSite team are very reactive to ..."